In the part of Mid-City where Pico and Hauser boulevards intersect, outdoor gathering spaces aren’t exactly abundant—in fact, they’re almost non-existent. A community group, with help from a local architecture firm, came up with a solution: Make something cool out of the space you do have. 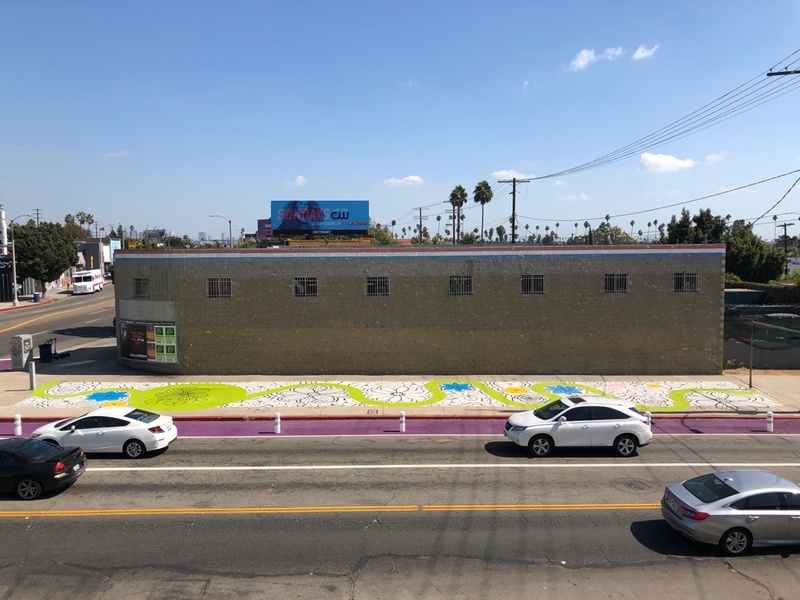 About a week ago, the Pico Great Street Collaborative and June Street Architecture unveiled “Coloring Book,” an interactive installation on a stretch of sidewalk along Hauser Boulevard, just south of Pico. 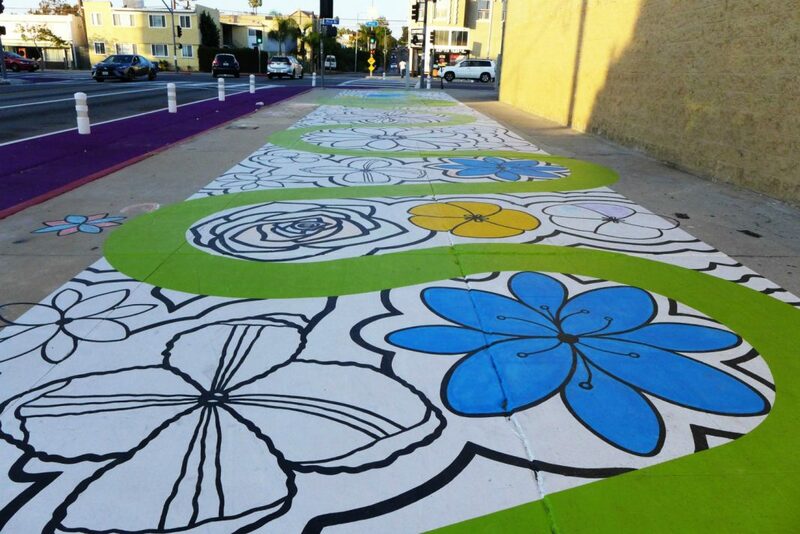 A green path wends its way through a garden of graphic flowers with bold, black outlines—some are already colored in, but the empty ones are meant to be colored in with sidewalk chalk by local kids and passersby. It’s part of a broader movement throughout L.A. to turn utilitarian paved areas into spaces where people can congregate. In March 2012, the city’s People St. initiative launched Sunset Triangle Plaza in Silver Lake, which turned a chunk of Griffith Park Boulevard just off Sunset into a hangout with tables and chairs. In 2016, People St.’s Motor Avenue Parklets debuted, turning parking spaces into mini seating areas and community gardens. This stretch of Hauser where “Coloring Book” has popped up was also part of a recent project to make the Pico corridor more pedestrian friendly by creating bright purple extended curbs. The project focuses on five blocks of Pico, from Curson to Burnside. The installation will be there for about a month until June Street Architects gets approval to initiate its next community project. According to a press release, the Pico Great Street Collaborative is hoping the project will breed more long-term installments in the neighborhood.